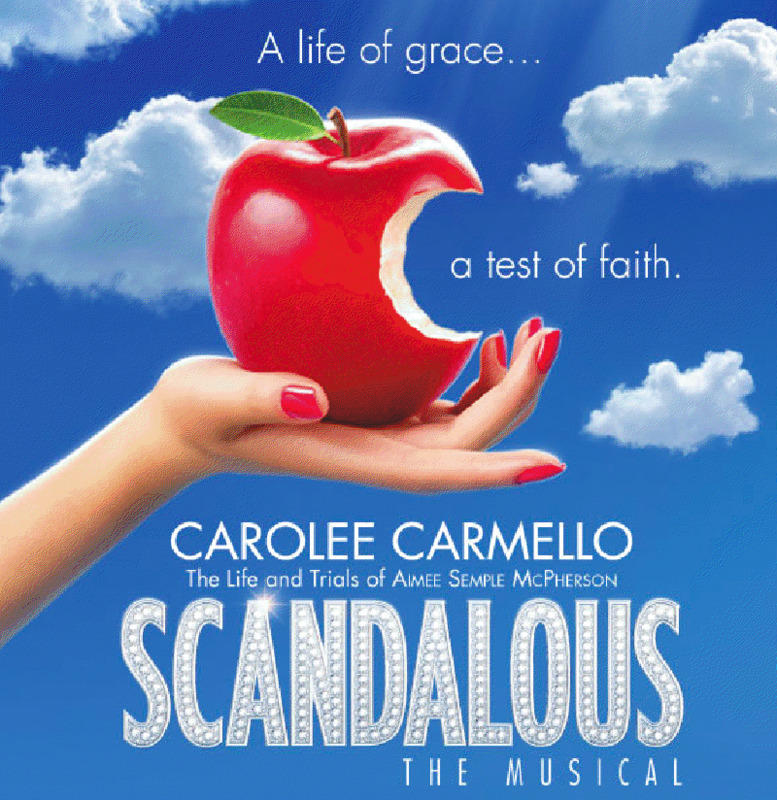 Two-time Tony Award nominee Carolee Carmello stars as Aimee Semple McPherson, the trailblazing media superstar whose passion for saving souls was matched by her passion for making headlines. Set in 1920s Los Angeles, holiness collides with Hollywood in the extraordinary tale of one woman's charismatic rise to fame. But as her popularity grows, so do her enemies, until her sermons, her celebrity, and her past combine to put everything she believes in on trial. Two-time Tony Award winner George Hearn leads a remarkable cast of 20 in this new musical about one woman's incredible rise to glory...and fall from grace. I was offered a chance to go watch the musical free of charge, to give my opinion and review of the performance. I would have loved to go watch the performance. But, unfortunately, the distance was a hindrance. So, instead, I was offered a soundtrack from the musical. I was pleasantly surprised with the quality of the 3 songs that I was able to listen to on my CD. High quality, great music and vocals, entertaining lyrics. From just the 3 songs on the soundtrack, I'm not able to get a complete feel of the musical. But I am intrigued. I will say that from the songs I listened to, I'm guessing the musical isn't what would be considered "G-Rated". But then again, I think it is assumed that most shows on Broadway are not "G-Rated", but geared towards adult audiences. I have never heard the story of Aimee Semple McPherson, but after hearing the songs and reading the teasers, I would like to learn more about Aimee and her story. One of my readers will receive a free copy of the 'Scandalous the Musical' Soundtrack. To enter, leave a comment on this post. For an extra entry, follow my blog and tell me that you do. I will accept entries until December 5, 2012. "Learn to Sing Your Best with the Ultimate Personal at Home Voice Lessons! 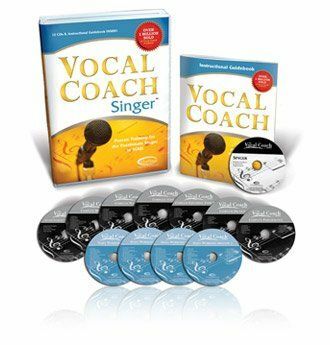 Vocal Coach Singer includes 7 professionally produced training CDs, 4 workout CDs, and a full-size instructional guidebook so you can quickly gain more power, clarity, and confidence in your singing performance. Plus you will receive 1 CD with printable lead sheets for every vocal exercise and your own singer’s journal. Vocal Coach Singer is the most complete instructional singing system available with the equivalent of over $2,000 worth of personal coaching time. Whether you are a beginner or a professional, Vocal Coach Singer teaches and builds upon the fundamentals essential to an accomplished singing voice. From posture to performance our tested and proven techniques will help you deliver your songs with consistency and confidence! With our easy-to-use step-by-step singing lessons, you'll hear AND feel the difference in a matter of days! This is the only course you'll ever need to not only learn to sing your best, but also maintain your singing voice for years to come." They also offer a "Teaching Kids to Sing" set for ages 5 to 13. 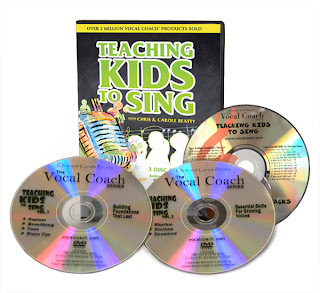 Teaching Kids to Sing 2-DVD/1-CD Set is the perfect way to teach your children and their leaders about the child's voice. All the foundations from Posture, Breathing, Tone, Rhythm, Diction and much, much more is explored and demonstrated. The cast includes Chris & Carole Beatty and a group of children ages 5 to 13. The CD contains all the music used on the two DVD's in two versions: With vocals and track only. This allows your young singers to learn, then perform the songs. "Chris & Carole Beatty, creators and founder of Vocal Coach, have taught and coached thousands of singers, young and old for over 40 years. Vocal Coach is built on their passion for training the singers of today and tomorrow through their time-tested, million-selling products as well as in the Vocal Coach Voice Studio in Brentwood TN." Two of my daughters regularly perform in musical theater productions. As such, singing is a big part of their lives, especially when they are cast for solos. None of us have had any formal training in singing. So, this past year, I have been debating signing my teen up for voice training. I figure that this is something she is very serious about and something she wishes to continue with. So what was holding me back? The expense of a private coach and also the time commitment of having another "must be there" added to my schedule. So when the Vocal Coach came up for review, I decided to give this a try before signing up for voice lessons. Why? This is something that we can do in our home, on our own schedule. And the expense, although somewhat pricey up front, is a one-time expense. An expense that pays for itself in the first month, based on the fees I have seen advertised for weekly lessons with a voice coach. So it was definitely worth a try. I received the program as an MP3 download. It downloaded easily and ran well. Given the choice, I would have loved to see this program on DVD or as a video download. I am a very visual person, so it would have helped me immensely to be able to view the instructor and watch exactly how he was standing during a posture lesson or to watch exactly what shape his mouth was in when he made a certain sound, etc. And of course, it would have just made it easier for me to concentrate and focus in general. Maybe this is something they will consider in the future, for us visual learners. Since we have had no formal voice lessons, most everything in the lessons was new to us. I appreciate how the Beattys start with the basics. You can't expect to sing well unless you have the correct posture. The posture lessons were fun, I thought. It made me feel a little silly, but no one was watching but my daughter. And I have found myself thinking about it and correcting my posture throughout the day. Next up is voice warm-ups. You know...all those silly sounds that singers make when warming up before a performance. Wow, if I thought I felt silly doing the posture exercises, I felt SUPER silly doing the voice warm-ups. But again, it was just me and my daughter. So I had great fun with it and we were both laughing and having a good time with it. Of course, we found ourselves breaking out in a grand rendition of "Do Re Me". Chris breaks it all down into bite-size chunks. Just a little at a time. And the benefit of this type of course is that you can rewind and practice as many times as you like. No extra charge for overtime, for causing the instructor to go over his time limit. If you decide your child would benefit from some private training and feedback, Chris does offer online training. I found it to be a little awkward at first. It was something new and different. And I wasn't used to the format. But they offer everything you need to get a good overview of the program and to make a plan for getting started. And it didn't take long to catch on. My daughter says she would still prefer an "in-person" instructor. But for now, I plan to have my daughter continue with the program. Why? I am convinced that she can learn a lot from Chris, in the comfort of our own home and on our own time schedule. And if the time comes, when she takes lessons from an instructor in a studio...well, just think of all the money I will save, when they realize just how much my daughter has already learned from using VOCAL COACH SINGER. Because as I mentioned, this course pays for itself in the first month. Yet it could potentially save me months and months and months of one-on-one coaching . I think the success of this program will greatly depend on your child. How serious are they about learning to sing well? Do they have the drive and determination to continue with the lessons and take the practices seriously, without an instructor prompting them. Will you remember to have them practice, without an actual weekly appointment scheduled on your calendar? Is your student a visual learner? Does he feel comfortable using computer files? These are all things to ponder in your purchasing decision. I believe a serious student will greatly improve their singing ability, to not only sing well, but to sing correctly. Disclaimer: I received this product free of charge, as part of the Schoolhouse Review Crew. The above is just my opinion. Please remember that opinions may, and do, vary. This week, my alarm has been waking me up with Christmas carols. When I go shopping, I hear Christmas carols playing in the stores. So, I think the season has officially started. So don your Santa hats and your Jingle bells, and have a holly, jolly Christmas this year! And while you are at it, take a peek at Melissa & Doug's Terrific Twenty Holiday Gifts for 2012. I am a HUGE fan of their products. Their toys are some of my top favorite gift ideas for my preschooler last year. And the plan is the same for this year! Stop by their Facebook page for a chance to enter. Starting November 6, they are giving away one gift every day for 20 days from the Terrific Twenty List. As if that isn't exciting enough, you can also enter for a chance to win one of Melissa & Doug's great products right here on my blog, courtesy of Melissa & Doug. 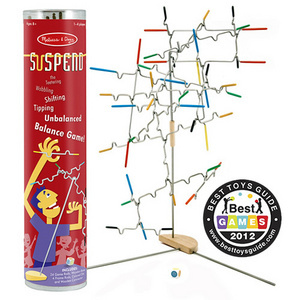 One reader will receive SUSPEND: Family Game. Read more about it below. "A family game of tricky hangs and steady hands! Try this hanging balance game and you'll be hooked! Suspend comes with 24 notched, rubber-tipped wire pieces to hang from a tabletop stand. Sound easy? Try adding another piece! Each time a bar is added, the balance shifts, the difficulty changes and the incredible midair sculpture transforms. Can you add all your game pieces without making it fall? This tricky game for 1-4 players is a test of steady nerves and steady hands." The giveaway on my blog will run through November 26, 2012. To enter, leave a comment. For an extra entry, follow my blog and leave a comment telling me that you did. Several other blogger friends are also having giveaways. So click on the links below for even more chances to win. Disclaimer: I am blogging about the Melissa & Doug contest and Top Twenty List, and offering this giveaway . In exchange, I will receive a free product from their top 20 list. FATHER OF LIGHTS chronicles the journey of filmmaker Darren Wilson and his team as they fearlessly travel the globe, far from the daily existence of the typical evangelical believer in the West. By thoughtfully documenting the stories of extraordinary believers and candidly filming miracles, visions and other supernatural occurrences, Wilson engages viewers in modern day examples of the true nature and character of God. Wanderlust Productions is a video production company focusing on creating content for various media that highlights, informs, and is designed to spiritually stretch our audience. Created by Darren Wilson, Professor at Judson University, Wanderlust’s focus is on telling stories that inspire and agitate, that are unwavering in their honesty yet are emotionally compelling. While our content will always be Christian in nature, we are not afraid to explore themes, concepts, or areas that may be considered “risky” by the Christian establishment. Wanderlust prides itself on its willingness to put the story above the message. That being said, the message will never waver. This movie endeavors to show just how real God is. It challenges us to believe that with God, anything truly is possible. God has the power. Do we have the faith? "Father of Lights" inspired me and challenged me and even brought me to tears...tears of sadness and tears of joy. It is very bold in its presentation, style, and methods. As I mentioned, some parts reminded me just how great our God is. Other parts made me uneasy and uncomfortable. I can't put my finger on it, but my emotions were mixed. This DVD does have some disturbing scenes and mature themes. I would suggest caution with young children and recommend viewing it on your own first. I am able to offer 1 copy of this DVD free to one of my readers. If you would like to receive a free copy of this DVD, please leave a comment below. I will choose one name on or about Friday, November 16, 2012.
by Stacy McDonald - Stacy is a Presbyterian pastor's wife, mother, grandma, conference speaker, and blogger. She encourages women in their marriages, motherhood, homemaking, chastity, and Christian culture. Illustrated by Johannah Bluedorn - Johannah has been homeschooled all of her life and is self-taught in art. She is an author and an illustrator. Foreword by Mrs. Jennie Chancey - Jennie is a wife, mother of ten, and the owner of Sense and Sensibility Patterns. Be sure to take a peek at all the other wonderful books available at Grace and Truth Books. "The Revised and Expanded Edition. Contains new, updated content and additional chapters. Godly women are not born, but raised. Raising Maidens of Virtue is a storehouse of tools for mothers to employ to raise up a daughter whose life will honor God. Written in an engaging style, Stacy McDonald conveys the truth through stories, conversations, illustrations, and memory-making projects, to warmly encourage girls to think Biblically about themselves and their world. Offers useful counsels on modesty, feminine beauty, guarding the tongue, idleness, sibling relationships, honoring parents, contentment and more." Purity and modesty, it isn't about the clothes you wear or how you style your hair. It is about your heart; it is about the reasons behind why you do what you do. Did you pick your clothes in order to solicit attention? Did you choose your hairstyle in order to look like the latest celebrity? When you go out, are you looking for a quick date, or are you keeping your future husband in mind? It is a choice. Live for God or live like the world. Dress modestly or dress like Hollywood. Date every guy who asks you out, or live with your future husband always in mind. It is about your heart. Be a lovely lady. A virtuous woman. A fair maiden. Both inside and out. This book is in its 7th printing, but somehow this is the first time I've heard of it. The thought of working through this book with my daughters thrilled me. I was so excited to get it and get started. 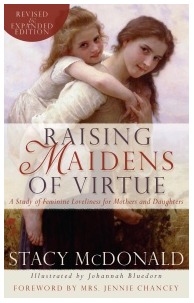 My heart's desire is for my daughters to be maidens of virtue. And I am thrilled to have found this book to help us on that journey. Stacy McDonald has such a delightful writing style. She uses analogies such as Hannah Hotstuff and Fanny McFrump to depict different attitudes about our attire. And wonderful stories such as "The Fence Dwellers", to show the dangers of spending too much time dwelling on things of this world and becoming desensitized to right vs. wrong. The lessons are very serious and our daughters would be wise to learn them; but Stacy teaches the lessons in ways that are interesting and sometimes, humorous. The book includes beautiful illustrations, very nostalgic. And heart-touching prayers. Stacy shares her heart and is very open with her readers. The questions at the end of each lesson are thought-provoking and open the doors for heart-to-heart discussions between a mom and her daughters. Reading this book with my daughters touches my heart. It reminds me what it feels like to be a young lady, trying to find her way. And it helps me illustrate to my daughters the importance of living a pure life, holy and acceptable unto God. My daughters are enjoying the stories and asking lots of questions. It is reminding me of the importance of searching my own heart on a daily basis. It truly is all about our hearts, having hearts turned towards God. The recommended age is 8-15, but I suggest using your own discernment as some topics may be a little mature, although all topics are covered in good taste. If all our daughters could learn lessons such as this at a young age, what a difference it would make. Again, it is all about the heart, purity of heart. "If a young woman is truly acting in love toward her brother (yes, the guys in your life are your brothers), she won't risk his heart or his purity by seeking to be pursued in a way that is outside of God's will. She won't play with his emotions or (by her actions, words, or dress) tempt him to think of her in an inappropriate way simply to satisfy some sort of fleshly desire inside herself." What a treasure this book is. How thrilled I am to have found it. How excited I am to continue on this journey with my precious daughters. "A wonderful gift for mothers and their daughters! Sarah Clarkson challenges young women to reach higher and go deeper in their relationship with Jesus Christ by exploring the spiritual journeys of biblical women whose faith moves and inspires us even today. Celebrate the beauty, sacrifice, and courage that made these women the heroines they are with this collection of inspirational stories and devotions. Through the journeys of Ruth, Esther, Mary, and others, learn how God can reach into the life of an ordinary girl who loves Him and bring His beauty and grace to bear in the world through her obedience. Recommended for ages 12 and up." More wonderful products available from Apologia. More about the author, Sarah Clarkson. Sarah's book is full of stories of "life and faith" for young Christian women, but also plenty challenging for more mature women as well. You will walk along side Mary & Martha, Mary (mother of Jesus), Esther, and Ruth. The stories of Esther and Ruth are my favorite stories of the Bible. Stories of women who were willing to do the right thing, no matter the cost. Women who put God first in their lives. Sarah takes the facts from the Bible, and intertwines them into longer, more detailed stories. Stories that allow us a glimpse into these women's hearts: their struggles and heartbreaks, their dreams and hopes, their deep love for God and for their families. I did stress to my daughters that the stories in this study were based on non-fiction, but that the author had used dramatic license to add details, not portrayed in the Bible. After each story, Sarah shares a devotional with the reader, using personal stories from her own lives. Then she follows it up with several Bible passages to read and ponder, with questions provided for a deeper study. Sarah wants to challenge young Christian women to "reach higher and go deeper in her relationship with Jesus Christ by choosing well and staying the course in her walk with God." It covers topics such as taking the time to "just be" in the presence of God, to not always be busy, but to take time to just be. She also reminds young ladies of the importance of knowing and believing without a shadow of a doubt, because everything else in your Christian life is based on that foundation. I found this to be an interesting study. When we read Bible passages, we hear the stories and think, "Wow, they were true heroines. They did the right thing." But when we read these narrations in the study, we take the time to ponder their hearts, and think about their struggles. Maybe they were scared. Maybe they were discouraged. Maybe, at least for a short time, they felt that Jesus had let them down. We see that these heroines were human, with the same struggles that we have, the same emotions we have, but when it came time to make a choice, they chose God. The topics are challenging and thought-provoking. The stories, about some of the Bible's amazing women, are engaging and endearing. The recommended age is 12 and up. I used this study as a read-aloud with my 10 and 13 year old daughters. I, personally, think the recommended age is a bit low. It felt to me like the book was written at an adult level, and I (as an adult) found some of the Bible Study questions to be challenging. I would recommended about 14-15 years old and up. I liked the idea of using the guide as a mother/daughter devotional study. 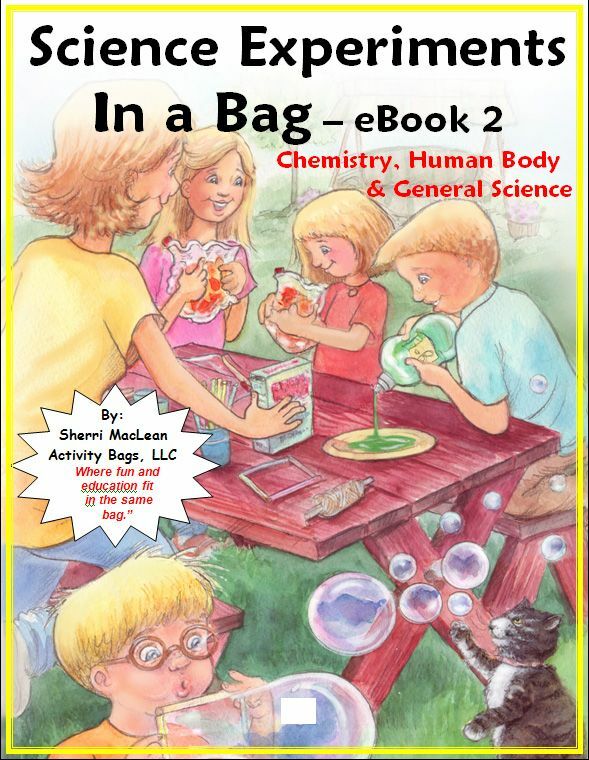 This book provides examples of 25 simple experiments that you can do with your children. This Ebook has 25 more experiments. This Ebook also has 25 experiments. 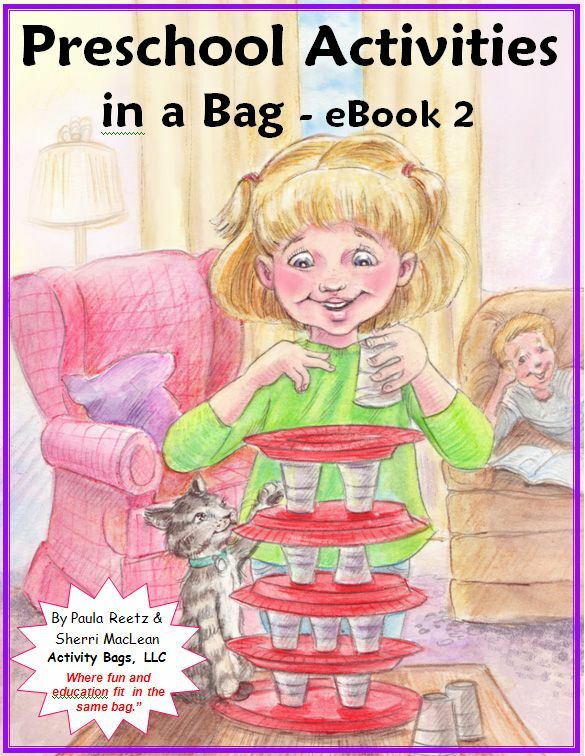 This Ebook features 34 activities that can be independently done and put away by preschoolers. 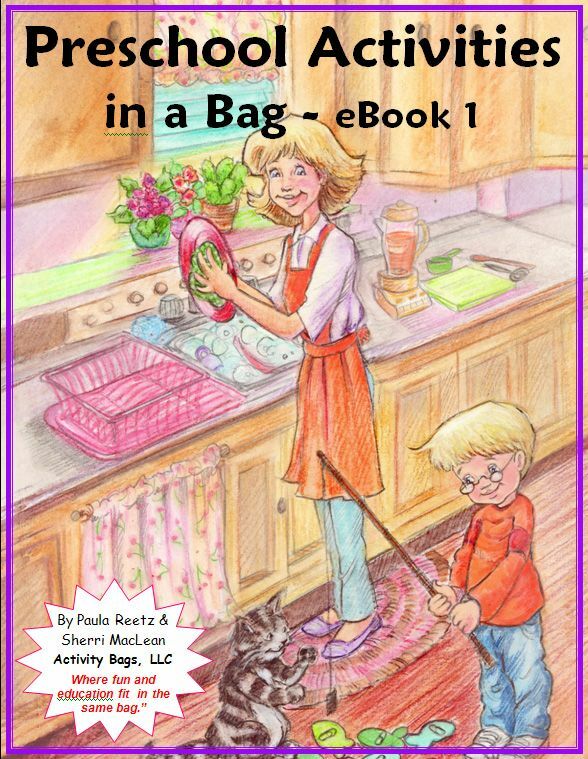 This Ebook features 33 activities that can be independently done and put away by preschoolers. I had heard about the Preschool Activity Bags and was intrigued by the idea. I think most homeschool moms with preschoolers have asked the same question over the years. 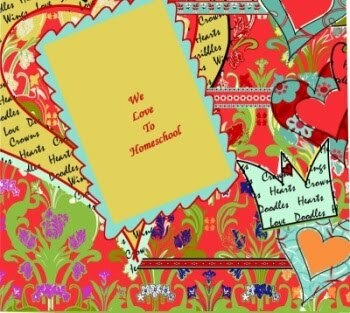 What can I do for my little preschoolers doing our family's homeschool hours? What activities, safe and educational, can they work on independently for short periods of time? What items can we keep in a storage tub to pull out during times when my older children need my attention for tough subjects? The Preschool Activity Bag sounded like it just might have the answer to all of these questions. But it gets even better! I didn't know they offered even more solutions, like the science experiments activity bags. Science is a topic that doesn't come easily to me. Not so much that I don't understand it or that I don't enjoy learning about it, but that planning and setting up experiments isn't my strong suit. So, we don't do as many experiments as we could. So, I was pleasantly surprised to see that this company also offers the science experiment ideas. I am so impressed with the detail that has gone into these Ebooks. In the preschool Ebooks, you will find an "activity skills chart". You can pick specific kits for color, hand/eye coordination, patterning, and more. The Ebook has an "activities at a glance", which lists each activity along with the skills learned, general supplies needed, and masters needed for the kit. It includes tips, frequently asked questions, and plans for coordinating a swap with other families. Each activity provides a supply list, detailed instructions on how to assemble the kit, and detailed instructions on how to use the activity. After you complete the kit, store it in a storage bag. Then store all the bags into a carton, storage tub, etc. This way, all the kits are easily accessible for your little preschooler. It is important to teach your child to clean up one activity before pulling out another, or else you will end up with a jumbled mess of kits all mixed together. I am so pleased with this concept, the variety of choices, the detailed instructions, and that so many of the supplies are either ones you probably already have on hand or can purchase cheaply. And most importantly, these are the kinds of activities that the little guys and gals LOVE, plus they will learn while they are at it. Check out this great idea! There is a spoon for each letter of the alphabet, both upper-case and lower-case. My 13 year old daughter labeled the spoons for me. We thought of several ways to use these, and I'm sure there are more. Use as intended, and match the upper-case with it's lower-case. Use to practice alphabetical order. Or use them to spell words. 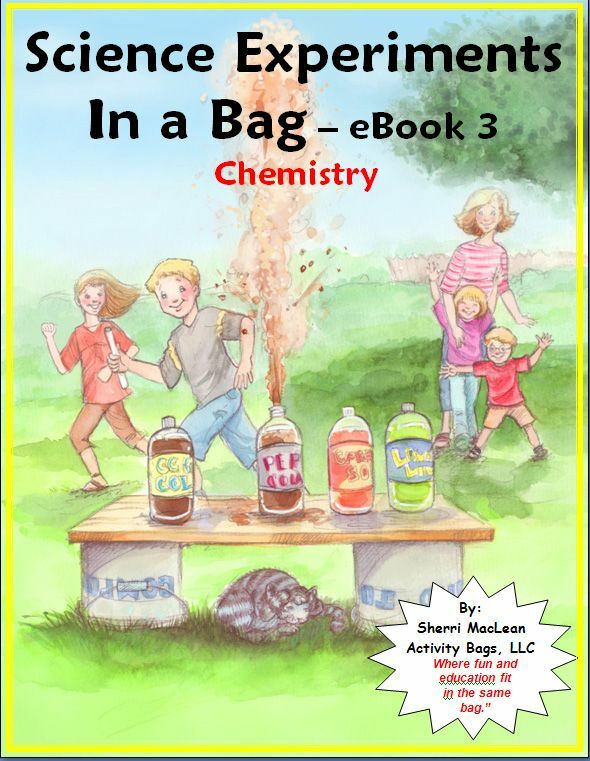 In the science experiment Ebook, you will find the same great quality as in the preschool Ebooks. Frequently asked questions, tips, etc. The experiments give detailed instructions for how to make the bag and also for how to perform the experiment. The experiments also provide observation questions and a space for notes. I appreciate that these are simple experiments which require easily-available supplies. But simple doesn't mean boring. These are creative, fun, and educational. Check out this experiment, called Can Crusher. We boiled a tiny amount of water in the can, then immediately after removing it from the heat, we used tongs to quickly immerse it upside down into a bowl of ice water. The immediate implosion was so exciting that we did the experiment three times in a row. But the Ebook doesn't just tell you how to perform the experiment. It also asks observation questions, then it includes the explanation about why the result happened. What exactly was taking place inside of that can to cause such an impressive implosion? The Ebook will tell you all about it. I am so happy to be chosen for this review. 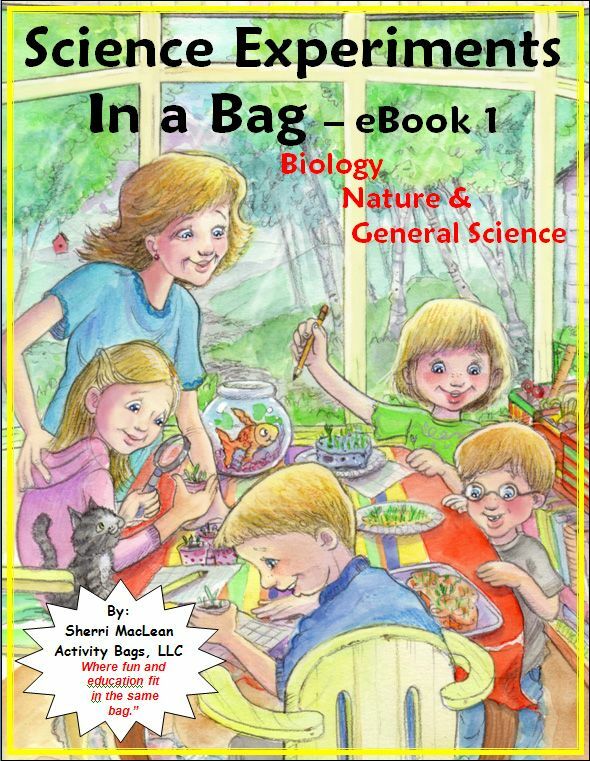 The preschool activity bag Ebooks are even better than I dreamed they would be. So many ideas and so simple. Yes they take time, but they aren't difficult. And once they are made, you will have a treasure trove of activities for your little one. The science experiment Ebooks are a welcome addition to our home. I love the idea of our family doing more experiments on a regular basis. And these are just the key to getting that done, with little expense and little prep, but with GREAT rewards.